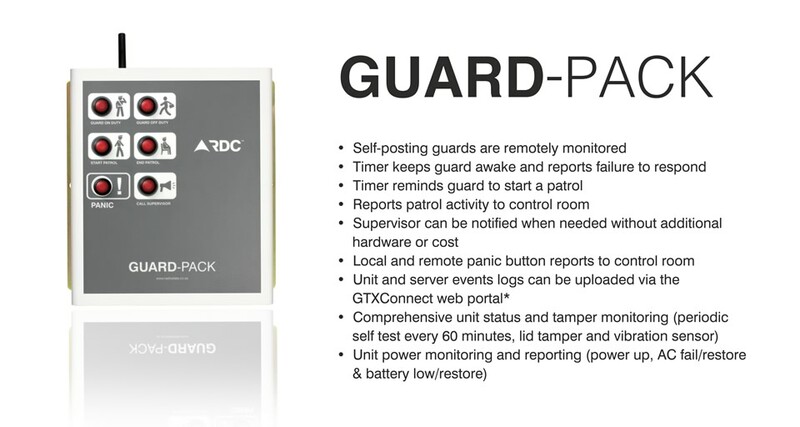 The Guard-Pack is designed to assist guarding companies deliver a reliable service to their clients, whilst keeping the cost of electronic monitoring to a minimum. The system incorporates a GPRS transceiver to ensure seamless and cost effective communications. Guard-Packs can be installed and/or monitored from anywhere within the cellular network provider/s coverage. Comprehensive hardware monitoring and reporting means that the control room knows immediately when there is an issue with the unit or when the unit is being tampered with. Pressed when the guard arrives on duty. A timer is activated which triggers a buzzer every 30/60 minutes to keep guard awake. Tele 1 signal is sent. 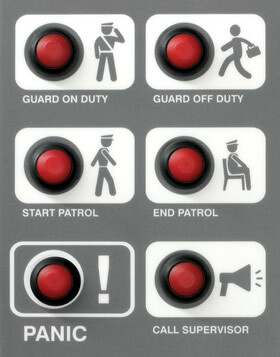 The buzzer sounds every 30/60 minutes once the Guard on Duty button has been pressed. On hearing the buzzer, the Start Patrol button is pressed to report that a patrol has been started and to silence the buzzer. Tele 3 signal is sent. Pressed in panic situations to request immediate assistance. Panic signals can also be sent using the remote panic key-fobs. RDC Panic signal is sent. Pressed when the guard's duty is completed. The 30/60 minute timer/ buzzer operation is deactivated. Tele 2 signal is sent. Once the guard has completed the patrol, this button is pressed to report that the patrol has ended. Tele 4 signal is sent. Pressed to inform the control room that the guard on site needs assistance from the area supervisor. Tele 5 signal is sent. RDC Alarm signal is sent. Up to 4 remote key-fobs can be carried by the guards on patrol which can be identified in the control room by a unique telemetry. Contact ID Panic (120) zones 1,2,3 & 4 signals are sent.